PowToon is Web-based animation software that allows you to quickly and easily create animated presentations with your students by manipulating pre-created objects, imported images, provided music and user created voice-overs. 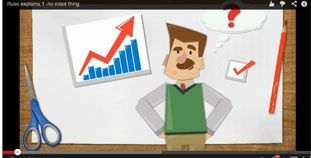 PowToon is used by businesses to create engaging, creative presentations that capture attention, and can be similarly used for educational assessment and content delivery. There is a free version available, as well as paid subscription that allows for more features. PowToon can be used by educators to create animated presentations of content for students to view. Educators can also use PowToon as a form of assessment by asking students to create their own animations. Using Audio/Video rather than standard presentation tools moves users away from over-reliance on text to convey ideas and users are able to create more engaging experiences for their audience. The provided objects and music are high quality and varied enough to allow for flexibility and creativity. The added ability to import images and create voice overs allow users to add their own touch to the animation. Creation of an account is easy and straightforward, and getting started is easy as well. There is no software to download, as PowToon is web-based. PowToon provides many customizable templates for beginning users, as well as a blank canvas for the more daring. Learning to use PowToon is as easy as learning any other presentation tool, but the end product is much more exciting. Simple drag and drop of text, props, characters and markers makes creation quick and easy. PowToon uses drag-and-drop of built-in features, props and characters, and easy searching of Creative Commons Licensed images from Flickr. PowToon, still in Beta form, has a growing list of video tutorials and a growing knowledge base. Users have two options for display of their work in the free version: they can export the animation to YouTube, or they can play the animation in PowToon in SlideShow mode, which allows for pauses so the presenter can interject further information. A new tool, Slides, is in the works as well. PowToon has made it easy for users to create professional- looking animations with little to no experience. Teachers can use PowToon in place of traditional presentation tools for multiple purposes, which means that it can be smoothly integrated into the existing curriculum. PowToon can quickly and easily be implemented by teachers as a content presentation tool, and by students, as a form of assessment. Students will be more engaged in teacher created presentations, as well as in creating their own as a form of assessment. PowToon is the answer to boring, text filled presentations that lose audience attention after just a few slides. With the ability to create voiceovers, add text, images, characters, props and music, users are able to create engaging, entertaining, professional quality animations. Students will be excited to express themselves in new ways, and teachers will reach more students. Engagement: Using animations in place of traditional presentations increase engagement with content. Creativity: Teachers and students alike are able to creatively express their message to the intended audience with no previous experience in animation. Flexibility: Even with the library of pre-created objects, the ability to import images and music, add text and create voiceovers means that PowToon can be used for a variety of purposes and audiences.